Trust us, it gets a lot more complicated from here. Every Friday, several A.V. Club staffers kick off our weekly open thread for the discussion of gaming plans and recent gaming glories, but of course, the real action is down in the comments, where we invite you to answer our eternal question: What Are You Playing This Weekend? We’re in a very good era for puzzle games at the moment; once upon a time, if you had a great idea for a devious brainteaser, you had to bend over backwards to get it onto a disc and out to people, often blowing past the prudent limits of your initial good premise in order to “justify” the scope of a full game. Now you can just develop that one good inkling, iterate it out until it’s been fully explored, slap the result up on Newgrounds (or Kongregate, or Steam, or wherever) and call it a day. The downside to this freedom is that it’s been a minute since we had a really big puzzle game, one that felt like a collection of lots of brain-squeezing ideas, instead of just one or two good ones. (And even our most recent entry in this canon, The Witness, often felt more preoccupied with its aesthetic triumphs than in carefully considered puzzle design.) 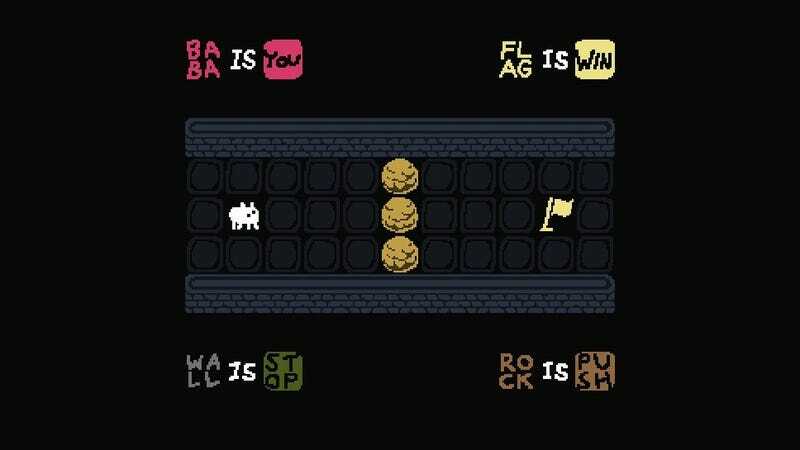 Thank god, then, for Baba Is You, which belies its cutesy looks with a set of logic problems as brilliantly fiendish as anything I’ve played in years. By making its core mechanic “manipulate the rules of the game itself,” developer Arvi Teikari goes full Alice In Wonderland with the game’s puzzle design, allowing players to do six impossible things before breakfast, then follow it up with another six for lunch. (There’s nothing like taking control of every wall in a level at once, slamming them through obstacles with abandon.) Great puzzle games are all about learning; about hunting for the crystal clear second when frustration melts into epiphany. Baba Is You delivers these moments with exhilarating efficiency, provoking that kind of delighted laugh that can only happen when the solution you’ve been staring past for 20 miserable minutes finally comes gloriously into focus. It’s exhausting, and incredibly frustrating, and easily my favorite game of 2019 to date. What Were We Playing Other Weekends?